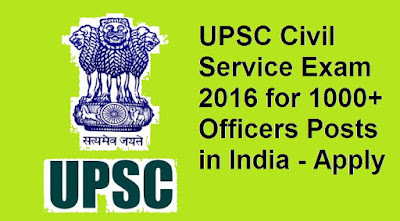 UPSC Civil Service Exam 2016 for 1000+ Officers Posts in India - Candidates looking for Government Jobs have a good news as UPSC has released notification for the UPSC Civil Service Exam 2016 for 1000+ Officers Posts in India. Eligible and interested candidates may apply online on or before 27th May, 2016.. For further details like age limit, educational qualification, selection process, how to apply, age limit can read the full notification. For any questions in mind feel free to ask below in comments. Union Public Service Commission (UPSC) introduce Civil Service Examination in April 2016 for the Recruitment of IPS, IAS, IRS, IFS etc posts. This exam can be applied by online procedure. As per notification total number of posts is 1079. The official notification has been uploaded, full information regarding these posts is below, we are requesting to all candidates please read full information carefully. Please download official notification from below link. Any query and problem just comment in box below, we will contact you immediately. Number of posts can be increase or decrease by department without any notice. 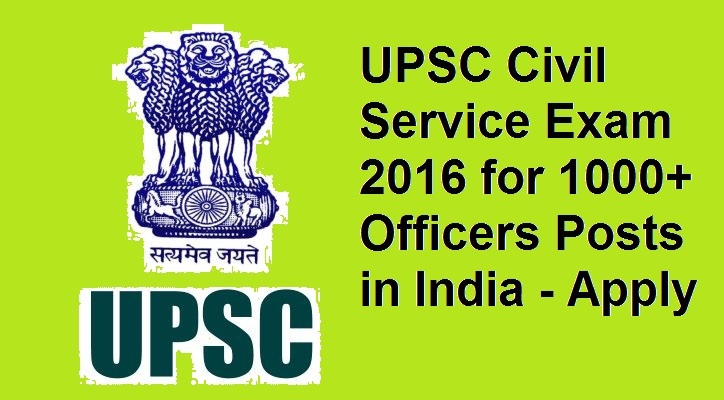 Read full information for UPSC Civil Service Exam 2016. Pay Scale : For pay scale details of all above posts, candidates please go through official notification. Educational Eligibility : Educational Qualification for all category candidates must be a Graduation degree of any University/ Institute with good academic records or its equivalent Qualification. Check the official detail for the complete detail. Age Limit : Age limit for all category candidates is in between 21 years to 32 years as on 01st August, 2016. Otherwise they will not eligible for Recruitment process. There is relaxation also in upper age limit for selected candidates. Application Fee : Application fee is Rs.100/- (One Hundred Rupees only) for all category candidates. SC/ST/PH/ Women category candidate are exempted from payment of an application fee. Pay this application fee in online mode only. Selection Process : Applicants will be selected on the basis of their performance in Union Public Service Commission (UPSC) Civil Service Exam 2016. A) To apply online for Civil Service Exam 2016 at UPSC, go through official website link given below. B) Check all details and all information regarding Civil Service Exam 2016. C) Apply online from 27th April, 2016 to 27th May, 2016. D) Take print out of system generated online application form for future reference. Candidates must avoid sending multiple application forms. Please mention active E-Mail ID only in the online application form. Starting date to apply online application forms is 27th April, 2016. Last date for submitting application forms through online is 27th May, 2016. So this was all about the UPSC Civil Service Exam 2016 for 1000+ Officers Posts in India. Hope you would have got all the details looking for. Candidates can apply for the post from the above details and can read the official notification for further details. For any questions regrading UPSC Civil Service Exam 2016 for 1000+ Officers Posts in India feel free to ask below in comments.